Max is knocked down, but definitely not knocked out by Jeff Mathis. Arlington is the hottest place to play MLB Baseball and Boston is one of the coldest. Max Ramirez & Mike Lowell won’t be going from one extreme to the other after all. Lowell needed thumb surgery. The deal is dead. Max Ramirez would have been valuable in the mix for the BoSox with Victor Martinez and the aging Jason Varitek. Taking his 55 MLB plate appearances into consideration, Max projects to full season numbers of .217, 19, and 86, if he can ever break through the log jam of MLB ready youngsters the Rangers have lined up behind the plate. Max is stuck behind Jarrod Saltalamacchia and Taylor Teagarden, who split the catching in Arlington. Salty projects to .251, 16, and 63. Teagarden projects to .236, 27, and 87. Ramirez is 25 years old and a three-time All Star in the minors. He was traded for Bob Wickman in 2007 and for Kenny Lofton in 2008. Scouts have compared Ramirez to Victor Martinez. Like V-Mart, Ramirez is unlikely to become a gold glover behind the dish, but he’s gotten better. 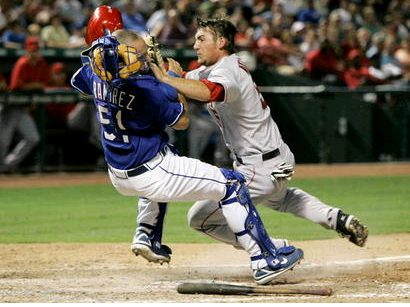 He made a play at the plate on 7.7.08 that made the high light reel for the year. Jeff Mathis steamrolled Max at the plate, knocking him groggy. Max held onto the ball and forced Mathis at the plate. Then Max gathered himself and threw out Casey Kotchman as he tried to advance to 3rd, completing a double play. Try googling up the video. It’s worth it. On Dec. 15, 2009, Peter Gammons commented that Max was leading the Venezuelan Winter League with 11 homers, but was also leading it in the consumption of chicken. Peter was just joshing. Max checks in at 5 ft 11” and 176 stones. Max was born and resides in Barquisimeto, VZ, the birthplace of the Orioles shortstop, Cesar Izturis. Max was born on October 11, the same date as 3x World Series Champion Orlando Hernandez, and the not-so-immortal Jarvis Tatum, Mike Fiore and Buttercup Dickerson. 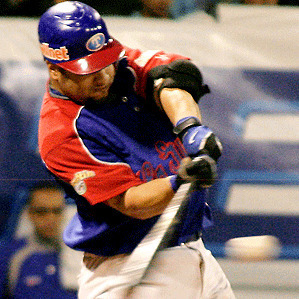 245 MLB players have hailed from Venezuela, including Bobby Abreu, Luis Aparicio, Tony Armas, Asdrubal Cabrera, Miguel Cabrera, Chico Carrasquel, Dave Conception, Vic Davalillo, Alex Delgado, Andres Galarraga, Alex Gonzalez, German Gonzalez, Luis Gonzalez, Carlos Guillen, Ozzie Guillen, Felix Hernandez, Victor Martinez, Melvin Mora, Dioner Navarro, Magglio Ordonez, Juan Rivera, Francisco Rodriguez, Johan Santana, Cesar Tovar, Ugueth Urbina and Omar Vizquel. Max’s career is an unfinished canvas. Had he come to the land of Dirty Water, he would have fit right in. But I doubt this is the last that we will hear of Max Ramirez. Catchers that are ready for Prime Time are a rarity. This 25-year-old backstop should get shot somewhere. Expect him to make the most of it. This entry was posted on December 22, 2009 at 1:26 pm	and is filed under BASEBALL, Mike Lowell. Tagged: Max Ramirez, Mike Lowell. You can follow any responses to this entry through the RSS 2.0 feed. You can leave a response, or trackback from your own site.